Less than a year after winning Britain’s Got Talent, Collabro have announced dates for their second nationwide tour. They will be bringing their ‘Act Two’ tour to Grimsby Auditorium on April 1, 2016 and tickets go on sale at 10am tomorrow, May 29. The tour will see the band travel the length and breadth of the country playing venues including London’s iconic Royal Albert Hall. 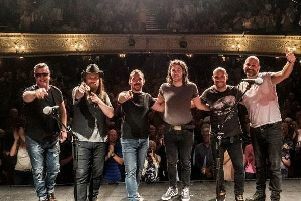 The announcement of next year’s tour coincides with the release of their second album ‘Act Two’ on, June 1 which comes less than a year after their debut album ‘Stars’ stormed to the top of the charts. The new album sees the band expand their musical horizons, recording some of the greatest songs that have influenced them as a band. The record includes some surprising re-interpretations of recent pop music’s finest moments such as Kodaline’s smash ‘All I Want,’ Christina Perri’s ‘A Thousand Years’ and ‘I Won’t Give Up’ by Jason Mraz. There’s also a touching rendition of The Rembrandts’ world-famous ‘I’ll Be There For You,’ which was debuted on the boys’ tour at the start of this year. Michael Auger, Richard Hadfield, Jamie Lambert, Matt Pagan and Thomas Redgrave only became Collabro at the start of 2014 and it’s been a steady stream of incredible moments since then. Tickets for the show at Grimsby Auditorium cost £39.50, £29.50 and £19.50, with premium seats ‘Up close and say hello’ £99.